New York wants all health workers to get flu vaccines. 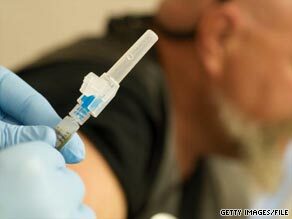 NEW YORK (CNN) — A New York state Supreme Court judge Friday granted a temporary restraining order against a requirement that all health care workers in the state get H1N1 flu vaccinations. The state health commissioner had said the workers had to be vaccinated against both seasonal and H1N1 flu by November 30 or risk disciplinary action. The Public Employees Federation filed suit, and Judge Thomas McNamara on Friday granted the restraining order, which will be in effect at least until the State Supreme Court can review the case during a hearing scheduled for October 30. A state health department release said officials “are confident that the regulation will be upheld.” It cited a 1990 court ruling that rejected health care workers’ opposition to mandatory rubella vaccinations. Banks noted that ruling “allows a philosophical or religious opt out,” which he said is lacking in the emergency H1N1 regulation. The Public Employees Federation is the second largest state employers union. It has 15,000 members who work in health care, approximately 5,000 of whom would be directly affected by the vaccination regulation.